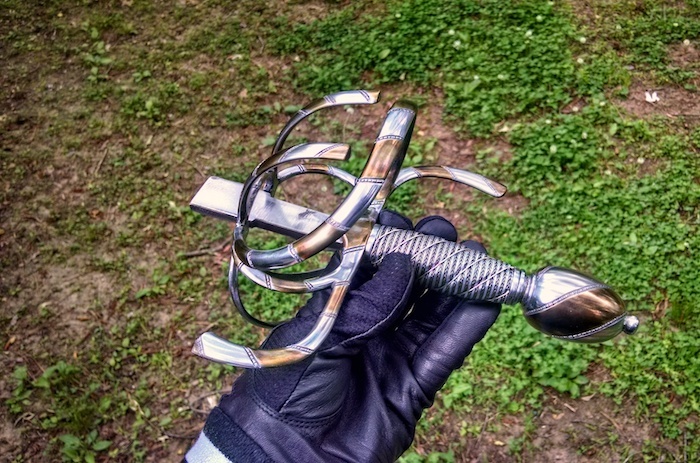 I wanted to share the rapier hilt i've been working on...this is based on a Swedish museum piece. I have just a single photo of the original I was working from, and I sort of picked and chose the details I re-created. 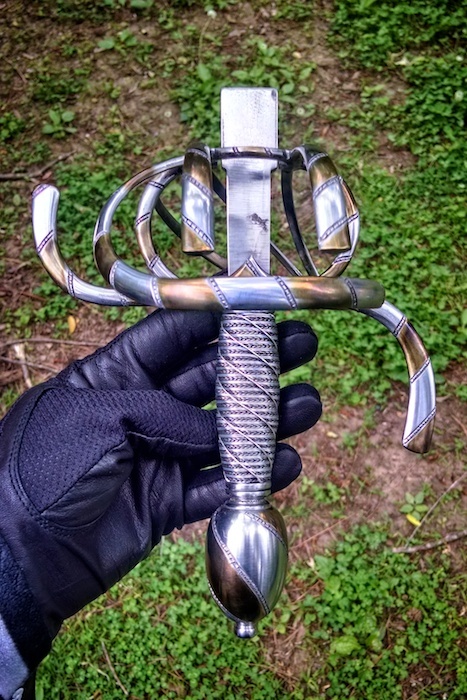 My hilt is carved/chiseled steel with a parti-color decoration done with plated brass. 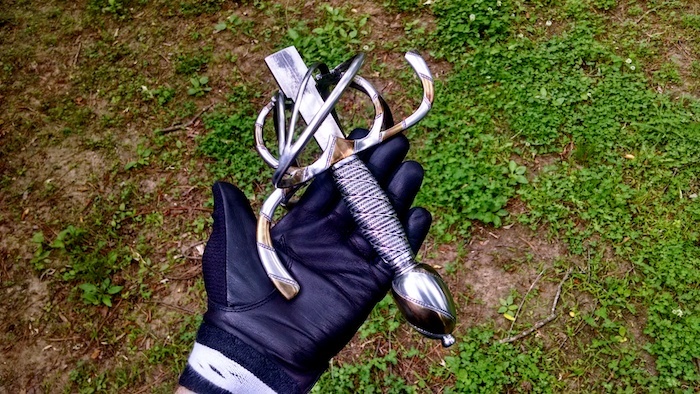 I'm not sure, but i'd guess the original is gold plated. 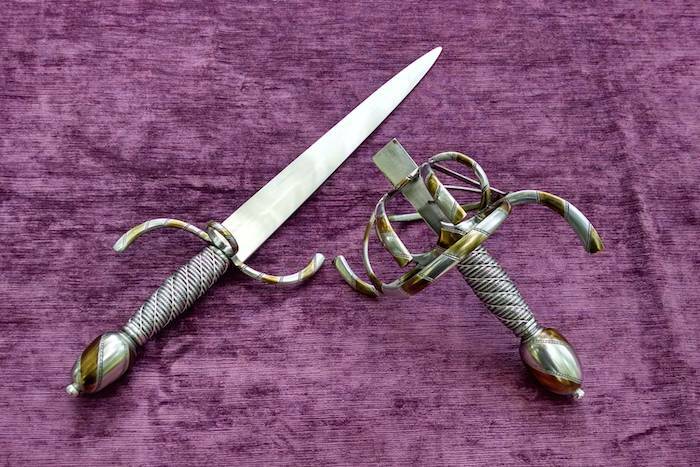 The grip is wrapped in steel wire with steel ferrules, and the pommels is designed to key to the tang and be secured with a recessed allen nut. 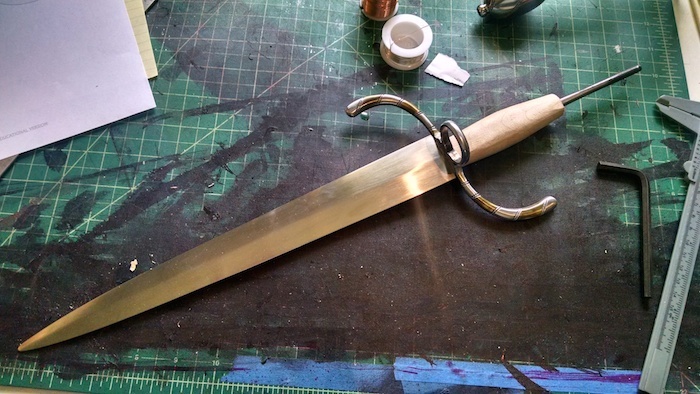 I'm in the process of working on a matching dagger, but I may leave that unfinished until someone decides they want to buy a set, rather than just the rapier. 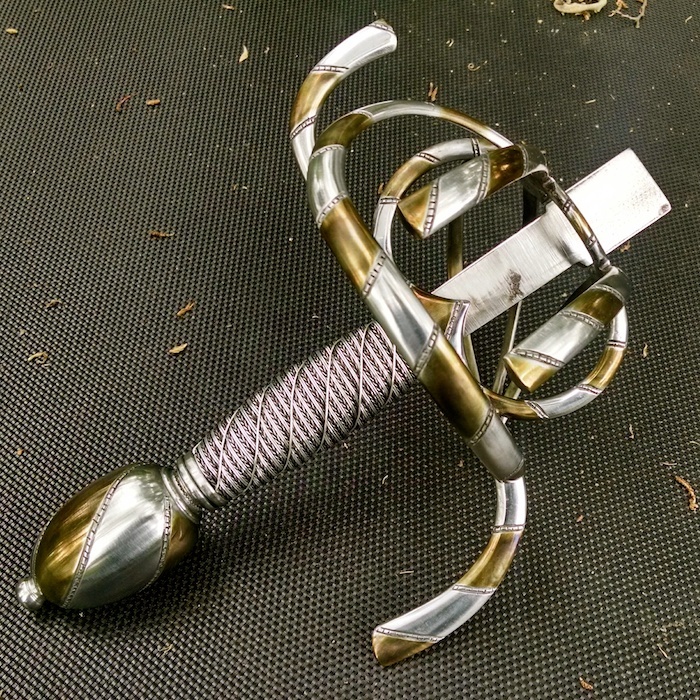 This hilt is available, and I can mount it with the blade of your choice from the manufacturer of your choice--sharp, HEMA, stage combat, etc. 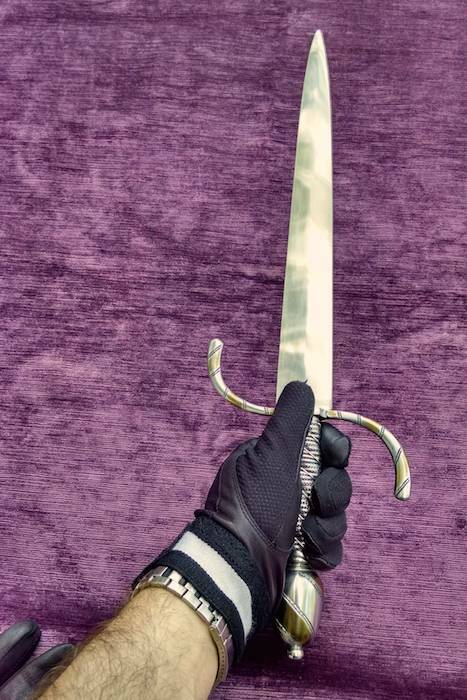 The hilt is $850 plus the cost of the blade. No extra charge for mounting the blade, unless it requires major modifications. That's really nice, and if I ever take the plunge into rapiers, I will come calling. If the dagger doesn't sell as a set, I would jump on that! But it should make a great set for someone. It belonged to Charles IX, king of Sweden 1604-1611. 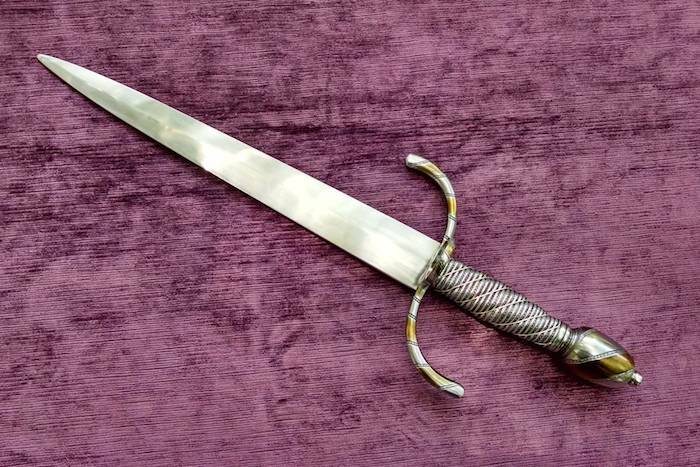 The blade is a nice cut and thrust type stamped with the mark of Clemens Horn, the famous Solingen blade maker. 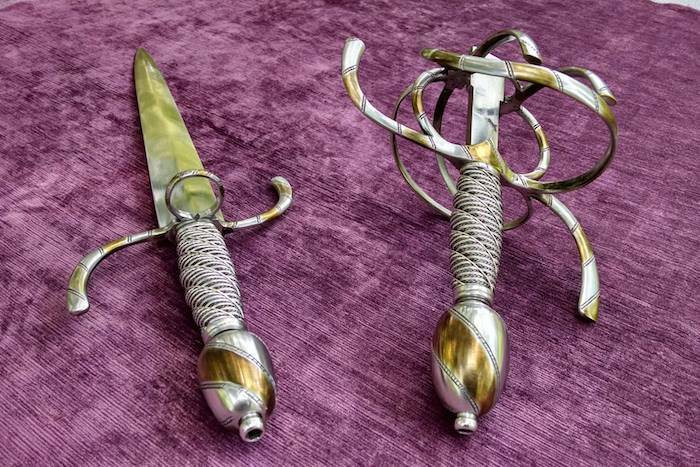 The hilt (silvered and gilt is sections) is stamped with the name Johan Pederson, Stockholm: so a Swedish hilt on a German blade, made for a king. 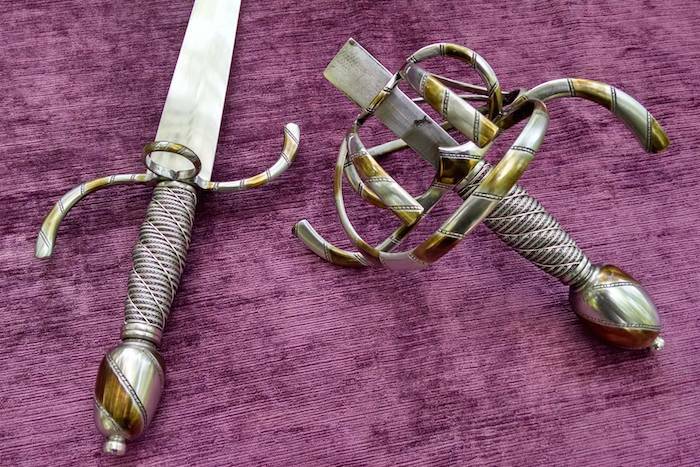 The sword is in the Royal Armouries in Stockholm. 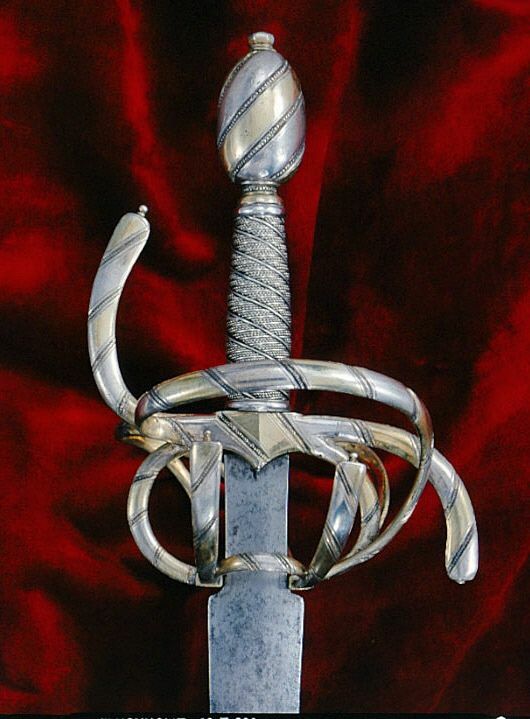 A very fine sword. And very nice work Jesse! I didn't know it was a royal piece, but I'm not so surprised. The original has as wonderfully understated grace and elegance--its a very simple decorative scheme, but very striking. really outstanding. the brass plating makes a nice contrast with the polished steel, and its perfectly executed. 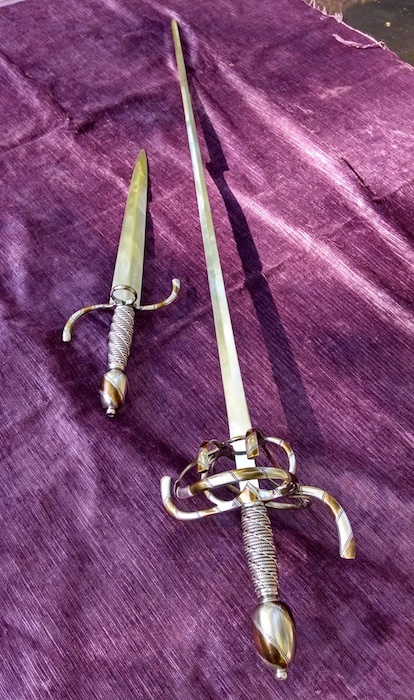 It took a little while, but I finally got around to finishing the matching parrying dagger that goes with this rapier. Here are some pictures of the set together. 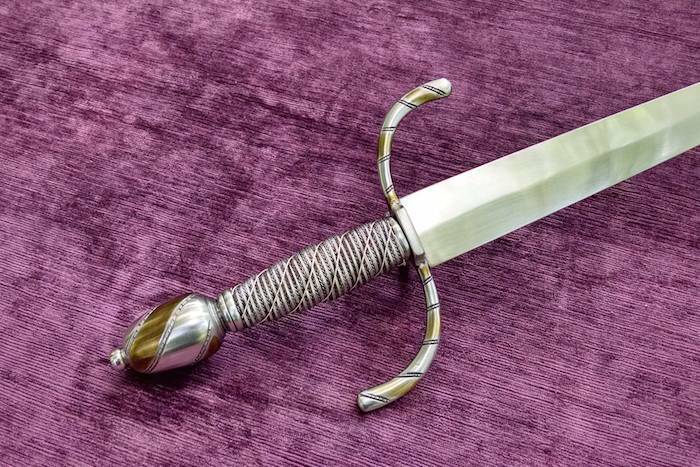 I still haven't mounted a rapier blade....I will wait for a customer to choose the blade they want. 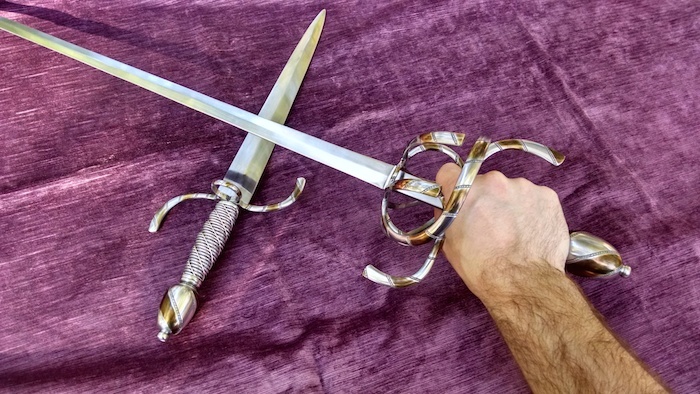 Based on advice from a highly respected member of the sword-making community (and this forum), I am actually raising the price on this set from what I laid out in my original post. 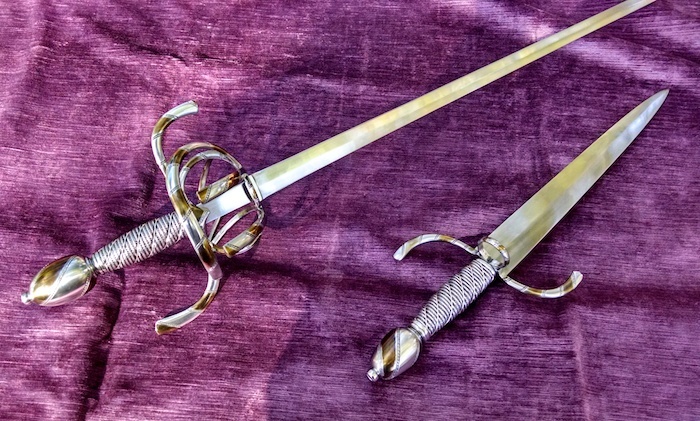 The rapier and dagger set are available for $1500 plus the price of whatever rapier blade the buyer chooses. 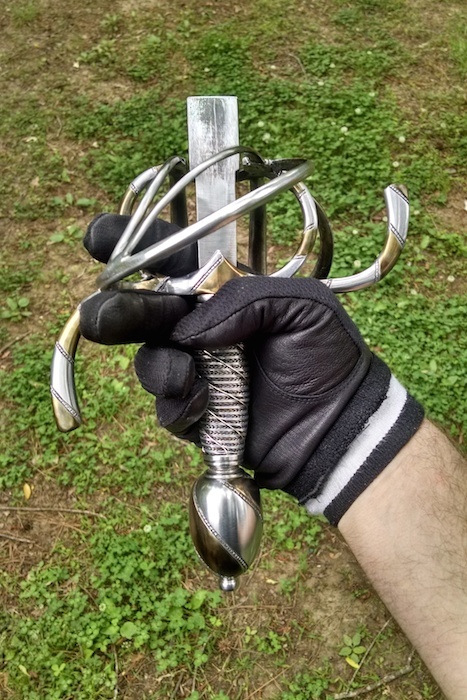 There is no extra charge for fitting the new blade to the hilt. 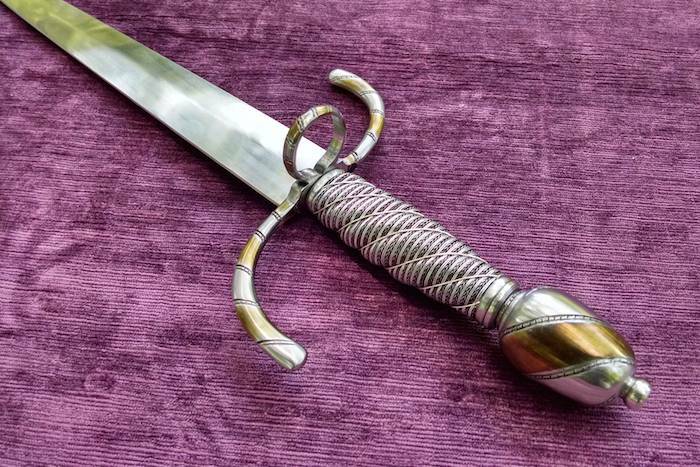 The dagger blade can also be refit if desired...at the moment it's a 12" blade with a blunted edge, but its stiffness would make it unsuitable for thrusting in some HEMA contexts. 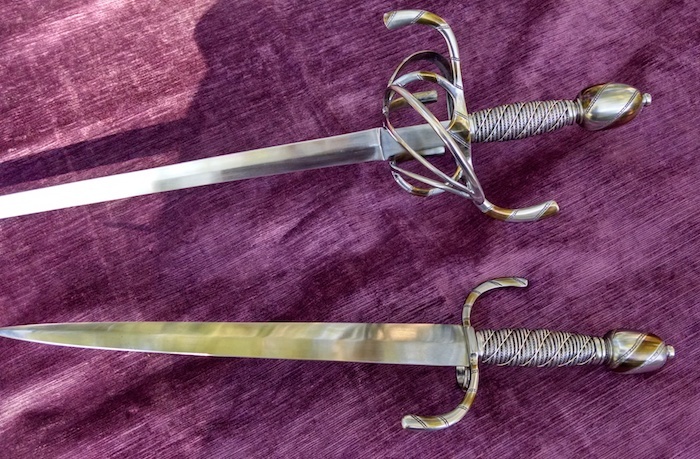 Here are a couple pics of this R&D set fully mounted....the rapier is mounted with a modified Hanwei Practice Rapier blade. The blade is 37" long and has a reshaped ricasso. 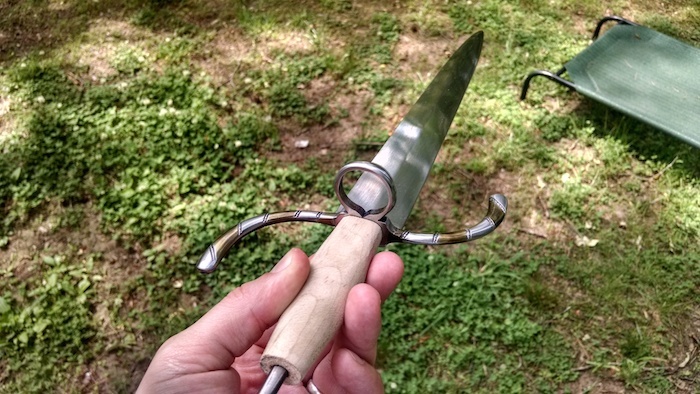 The dagger is mounted with a 12.25" blunted blade. 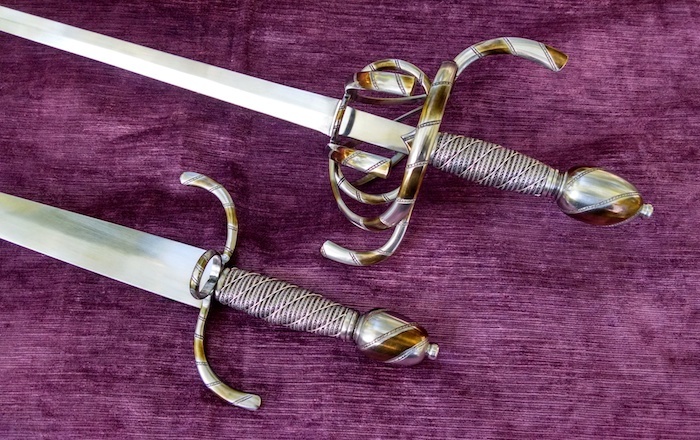 Alternatively the rapier can be remounted with the blade of your choice from the manufacturer of your choice--sharp, HEMA, etc. POB 1" in front of the guard.